Pepper plants are a warm season crop that grow well in containers due to the plant's compact size. Gardeners can choose heirloom pepper varieties or stick with common bell, jalapeno or cayenne peppers. Start your pepper container garden when frost danger passes for your area, since these plants can be damaged by cold weather. All vegetables should be planted in a container with drainage holes at the bottom, which allow excess water to flow out of the container. Planting in containers that lack drainage holes encourages root rot, which will kill the pepper plant. Texas A & M suggests a 5-gallon container for peppers. Container grown vegetables fare best when grown in a potting mix, rather than soil. Ohio State University suggests 1 part each of compost, perlite, sphagnum peat moss and potting soil as a good potting mix for vegetables. Gardeners can choose either sweet or hot peppers for container growing. Since pepper plants don't sprawl, they are better suited to pots than trellising or sprawling vegetables. Texas A & M recommends jalapeno, hot red cherry, Canape and Yolo Wonder, although any type of pepper can fare well. Fill your container one-half to three-fourths full with potting mix. 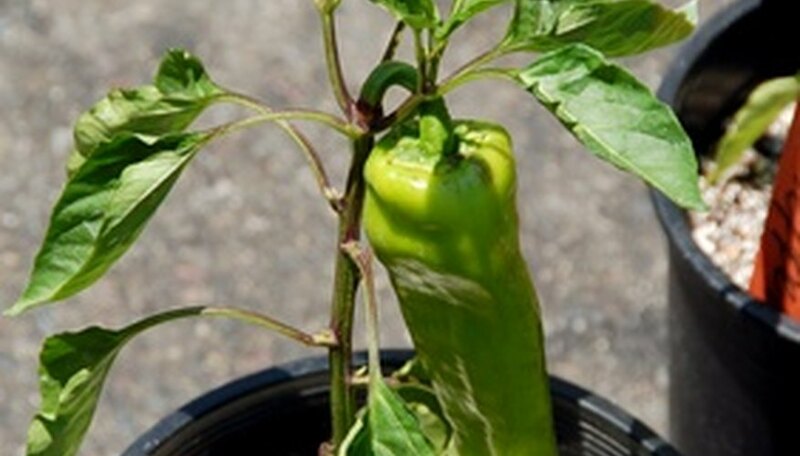 Then pull your pepper plants from their containers and break apart the root ball by squeezing it. Plant the peppers in the container, leaving 14 inches in between plants. When all plants are in the container, fill the pot the rest of the way with potting mix, leaving 1 inch of space at the top. Gently firm the potting mix around the pepper plants. Water the newly planted container garden until the soil compresses around the plants and water flows out the drainage holes at the bottom. Place the container where it receives full sun. Prepare a master fertilizer by mixing 1 gallon of water with 2 cups of 10-20-10 fertilizer until the fertilizer dissolves. Then mix 2 tbsp. of this master fertilizer with 1 gallon of water, and water the pepper plants with this mix once a day. If the container receives rain, skip watering until the soil becomes barely moist (almost dry) to the touch.